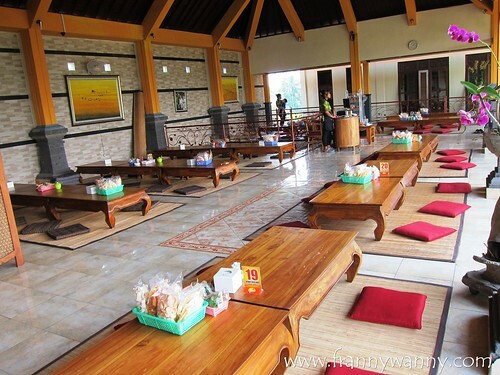 Okay, let me get started on my Bali trip by telling you one of the foodie highlights of our weekend getaway there. This trip was actually to celebrate Paul's birthday with his closest cousins and since we started this "tradition" by going to Kuala Lumpur two years ago, we agreed to celebrate once again this time in Bali. There are no plans yet on where we're celebrating this year but I'm hoping that for once..it will be somewhere cold-er. On our first day in Bali, Paul and I found ourselves alone as his cousins were scheduled to fly in much later than us. Not wanting to waste any time, we booked with Swatika who became our friendly tour guide/driver for one day. 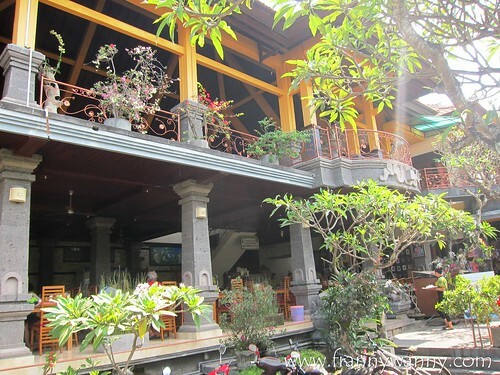 Prior to our trip, I told him the places I wanted to go and since we will be staying in Seminyak all throughout our trip, he suggested that we go to Ubud which is an hour or so drive from the central area. We got to Bali a little past 9 in the morning and right after a quick check-in at Pullman Hotel, we headed to Ubud for Ibu Oka, our first stop of the day and also known to be the best place to enjoy Bali's signature dish called Babi Guling. A little background about Bali, while a big population of Indonesians are practicing the Muslin religion thus pork is not allowed, Bali has the biggest percentage of Balinese Hindus who can definitely have pork but they can't take beef. 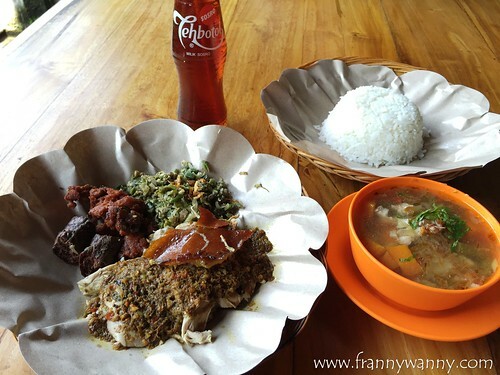 That said, this is probably one of the few places in Indonesia where pork dishes are really abundant. Paul and I were busy chatting in the car that we failed to notice exactly how Swatika ended up at Ibu Oka. All I remembered was he entered a small street and parallel-parked at the side. As soon as the car stopped, we spotted the huge restaurant signage. We're here! The place was huge! Since we got there pretty early for lunch, we were able to get a nice table at the ground floor. I can imagine how this place can get filled up especially at night. We're totally loving the nipa hut like interiors with a touch of Balinese decors. Paul couldn't help but go up the second floor to take a peek. It's so cool that diners at the second floor will get to sit on the floor as the tables are really low yet this has a more comfy vibe as opposed to the very traditional and formal set-up downstairs. While we would have loved to experience dining at the second floor, we didn't want to bother the staff to transfer all our food up in order to cater to our whims. Now, on to the food! Of course we went for the Babi Guling Pisah (Rp. 70,000) which is a full plate of babi guling, veggies, side dish and a bowl of soup too. Since we planned on eating our way around Bali, we agreed to just share on one order to leave more space for the next food stops that we're heading to. Okay, so growing up in a country that's known for roasted pork (lechon), what was our honest verdict about Bali's Babi Guling? It was the BOMB! While it wasn't as salty as our local lechon, we love the crunchy skin and the juicy meat. It came with a bit of Fried Meat which reminds us so much of the Campampangan tocino and some Sausages too which we weren't too wild about as it's somewhat like blood sausages which had a very powdery texture. How silly that we failed to notice that our plate actually comes complete with vegetables too and yet we still got one whole order of Sayur (Rp. 20,000). Well, one can never have too much veggies right? The sayur is a delicious vegetable dishes consisting of chopped beans, papaya, leaves and simmered in fresh coconut cream. It was really yummy and it's best enjoyed with rice. Trust me. I also got to try the ever-popular Teh Botol (Rp. 7,000) which was pretty much brewed tea in a bottle. It had no sweetness at all which was okay for me but Paul didn't liked it at all since he's not a tea drinker to begin with and for him, iced tea just have to be sweet. 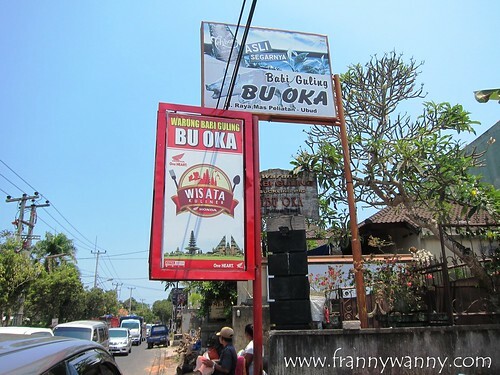 We really enjoyed our first stop at Ibu Oka this I tell you, this is one place you shouldn't miss when you visit Bali. 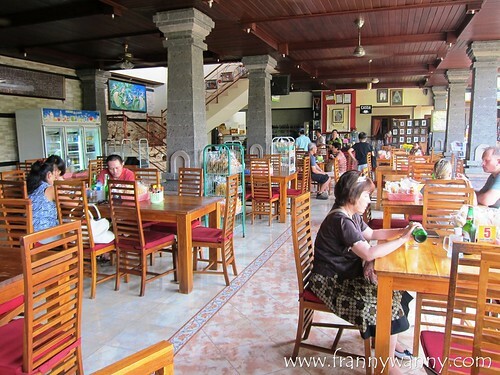 The service was also very good as the servers were very attentive and friendly. 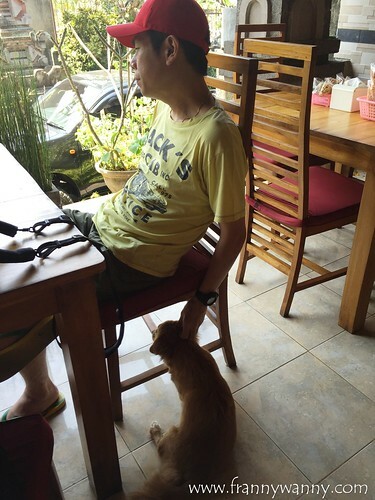 Well, looks like everyone in the restaurant were friendly even this furry friend who cozily came up to Paul for a good scratch and pat. Here's my husband in his Doctor Dolittle persona. 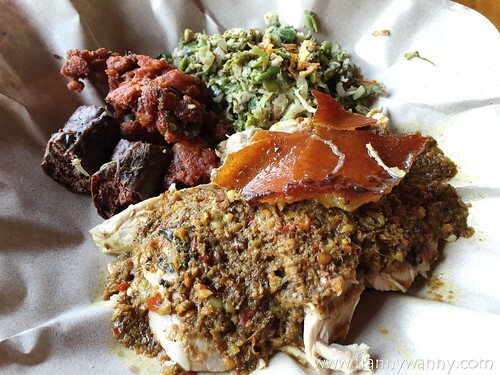 Check out Babi Guling Ibu Oka at Jalan Suweta, Ubud, Kec. Gianyar, Bali, Indonesia. For reservations, call them at +62 361 976345. Need a tour guide/driver? Call Swatika at +62 812 3816465 or email him at swan_tika@yahoo.co.id .